The Standard and the Giant are fairly easy to differentiate. The simplest way is to measure the height of that second batten pocket (the smaller one near the clew of the sail). The Standard has a batten about 18" high. The Giant batten is about 24" high. The other way to tell is the Giant is approximately 10.5' tall while the Standard is just about 10' tall (measuring just the sail luff pocket). The SuperNOVA and the Giant are the same height, but the second batten pocket on the SuperNOVA is typically in the 32" range. Oh very nice. Thanks for doing that. So I need to measure it this weekend. 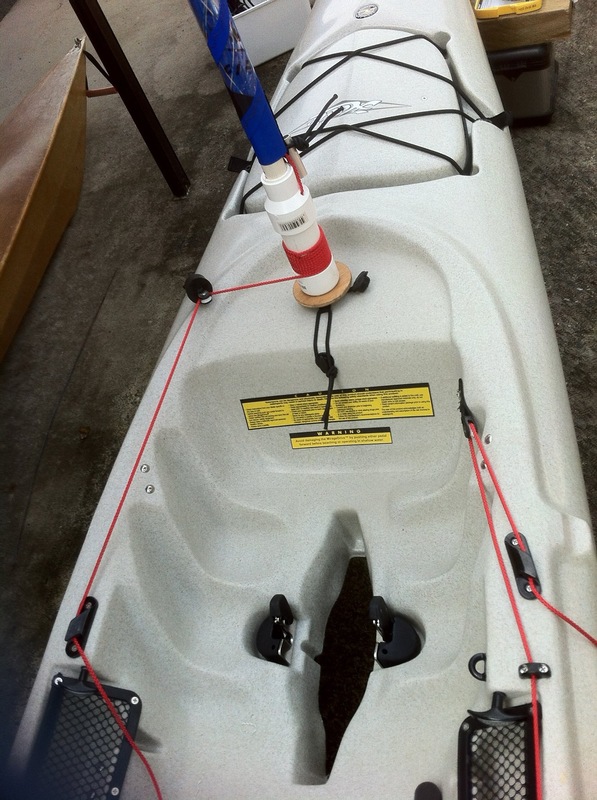 I had a tandem outfitter with Hobie sail about 3 years ago. No need for the AMAs, it was very stable. I peddle the 16 foot Revolution easily 4.3 mph with standard fins with same effort I managed 3 mph solo in the outfitter with turbo fins. I can’t wait to get the sail going!! Here’s a picture, circled what I need to measure right? Yep, that's where you measure. You have at least a Giant and it might be a Supernova ... your Revo is so long compared to the Outback that my perspective may be off (the sail looks like a Giant, bu that smaller batten appears to be for a Supernova). That rig will really move in calm water and light to moderate wind. My only issue with the Star sail (that I've detailed above in this thread) has been keeping sail shape when lying close to the wind in anything above a light breeze. It's not that the boat won't lie close to the wind, but I can't stand creases/crinkling even if the sail is still "working". The rocket launcher helps and I might stiffen the mast a bit, but that will put more stress on the mast receiver and narrow my margin for error for a turtle event in gusty conditions. Of course, tinkering with the rig is part fo the fun for me, so these are not really complaints. Seems my purchase included a supernova. The measurement is 36”and total height is 10.5 feet. Let us know how the sail works on that boat. It should really scoot along! 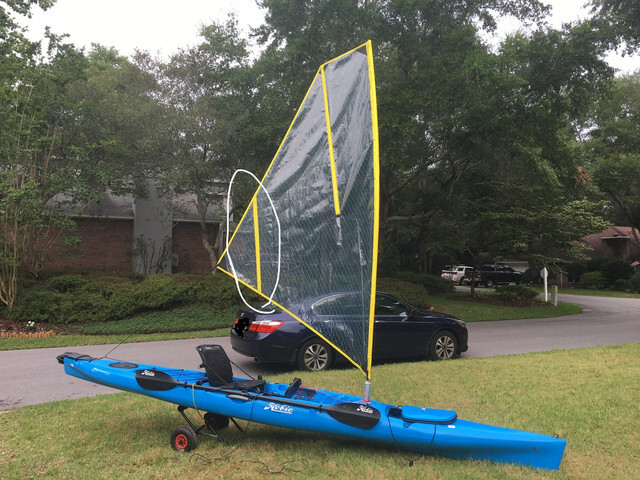 Here’s a picture of one issue with the Revo 16 and the Star sail. The line wraps below the spool where it should. 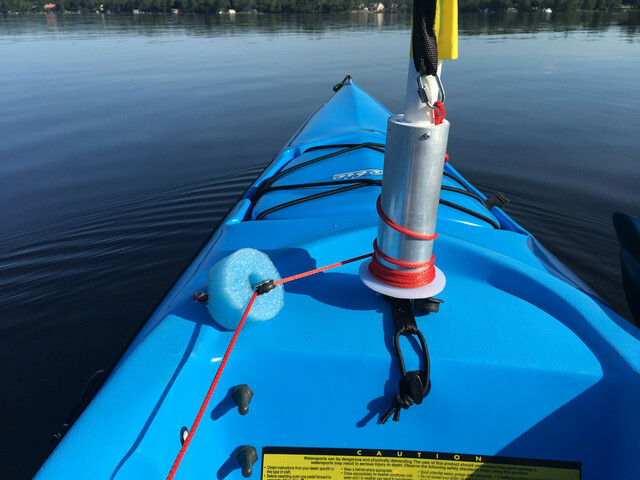 I need to lift the pulley on the left up off the deck when pulling out the sail so it wraps on the rotating tube, not under the white plastic disc. Maybe someone can suggest a fix. So since I've been researching this setup, I found this picture. Believe it was from the user 'skymax' on here. 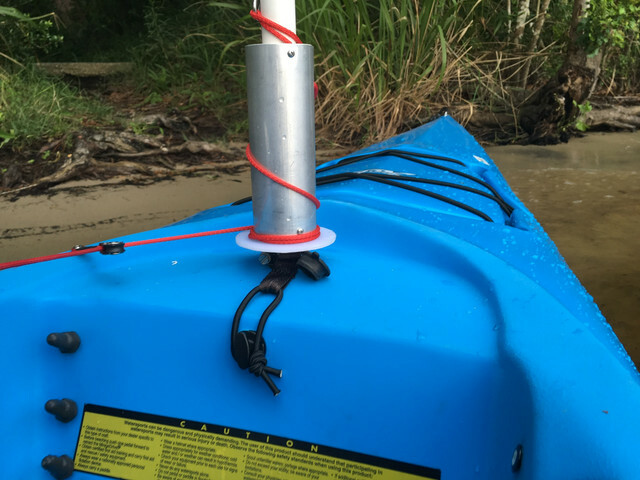 Looks like that furling pulley goes through some sort of rubber/foam piece that raises it up over the gunwale a little bit. Maybe that helps it?